The Beano is 80! 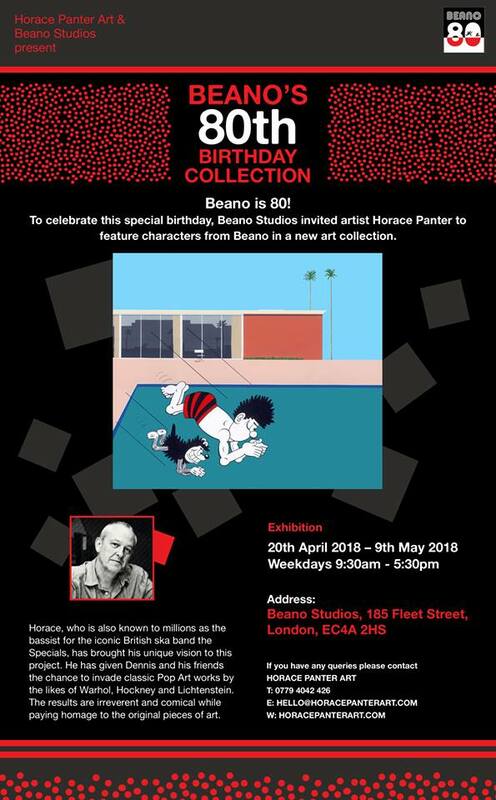 To celebrate this special birthday, Beano Studios invited artist Horace Panter to feature characters from the Beano in a new art collection. All the works are Pop Art, based on classic pieces by Lichtenstein, Warhol & Hockney. Dennis, Minnie, Gnasher, Lord Snooty, The Bash Street Kids and Billy Whizz all make appearances, invading the paintings with their own mischievous characteristics. The results are irreverent and comical while still paying homage to the original artists. For a chance to see the collection when it previews in London check out the dates and times on the poster. Otherwise, it’s also going to York, Dundee (home of D.C. Thomson comics), Glasgow, Dublin and Harrogate.